One thing that's always irritated me about the whole "World Music™" thing is the tendency to reduce whole genres of music to one or two artists who are supposed to represent whole countries or styles. Thus, Femi Kuti and Sunny Ade represent Nigeria, Tarika stands in for Madagascar, Angelique Kidjo Benin, etc. The artists in this "chosen few" get coveted spots in the chain music stores, tour the U.S. and Europe a lot, and often collaborate in the studio with well-known Western pop stars. After a while the sounds they make, at least for the World Music™ market, bear little resemblance to the music that brought them notice in the first place. There's a bit of dilettantism behind the desire by the latte-sipping masses for the latest "thing" in World Music™, a touch of condescension, as exemplified by the phrase "Bonnie Raitt thinks that Oliver Mtukudzi is the Otis Redding of Zimbabwe!" Now, just what the hell is that supposed to mean? I suppose I'm just cynical, or maybe I'm a bit of a snob myself. I certainly can't fault the above-mentioned "Western pop stars" who've done so much to promote World Music™, nor can I blame the African musicians who've benefited from the interest in it. It's just that there's only room in the Best Buy bins for so many World Music™ artists. The real culprit here, if there is one, is "the invisible hand of The Market," and not anybody's malice or greed. For a number of years Youssou N'Dour, and to a lesser extent Baaba Maal, have been the "officially approved ambassadors" of Senegalese music to the rest of the world. The many other musicians from that country who have toiled away in the local market for years have been pretty much shut out. One of these musicians is the extraordinary female vocalist Kiné Lam. Ms. Lam comes from a great griot family in the Cayor region of Senegal and in 1979 was selected as a featured singer at the Sorano National Theatre in Dakar. Her debut solo recording, Cheickh Anta Mbacke (Syllart 38764-1), was released in 1989 and since then she has issued numerous cassettes in Senegal, all but one unheard outside of the African market. The one exception was 1996's Praise (Shanachie 64062), which was released in the U.S. to a fair amount of critical acclaim. It coincided with a North American tour that was meant to introduce her to the World Music™ audience. When I heard that she'd be appearing in Chicago with her backup band Le Kaggu, I was of course beside myself, as I'd been following Kiné Lam's career for years and pretty much worshiped the ground she walked on. When I caught her performance at the late Equator Club I wasn't disappointed. The problem was the audience: apart from a very small number of American cognoscenti and Equator Club regulars, it was composed entirely of members of the (small) Chicago Senegalese community. So Kiné Lam has remained, outside of the Senegal diaspora anyway, an obscure quantity in the American music scene. In a way, I'm almost glad that Kiné Lam hasn't been accepted into the World Music™ pantheon; if she'd done a duet with Phil Collins, I would have gone into cardiac arrest! I would like more people to be aware of the work of this consummate artist, and that is the purpose of this post. Think of it as "Kiné Lam's Greatest Hits." In the future I will be posting work by other great female Senegalese singers. If I had to make a list of the ten greatest African albums of all time, Kiné Lam's Galass (KSF Productions KSF 03, ca. 1990) would be on it, although technically it's not an "album," having only been released on cassette. Transcendent vocals, knife-sharp guitar work, insane percussion - Galass has it all. The credits list Yahya Fall on rhythm guitar and no-one on lead, but that can't be right - the guitar plays more than a supporting role here: just check out the George Benson-ish licks on "SIDA." Itou Dieng plays bass; Massaër Diagne, El Hadji I. Ndiaye and Ousseynou Mboup are on percussion; Iba Ndiaye on keyboards and Ndiaye Fatou Ndiaye and Chuck Berry Mboup [!] on supporting vocals round things out. The musicians are working here like a well-oiled machine. Kiné's next two releases, while perhaps not scaling the same heights as Galass, still have some great moments. "Tabasky Thiam," from Balla Aïssa Boury (KSF 004), and "Dogo," from Leer-Gui (KSF 06), feature the same musical lineup as Galass. The synthesisizer work on "Dogo" reminds me of an R&B hit from some years ago (can't quite place which one). 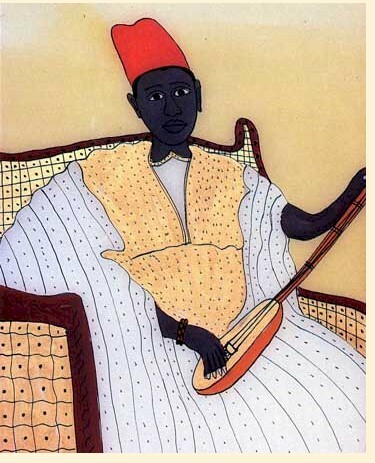 In the last few years, Kiné Lam has made a number of fine recordings with a "neo-traditional" ensemble including the outstanding xalam player Abou Guissé (center, picture below). "Mamé Thierno" and "Sourang M'beri" are from Sunu Thiossane 2, while "Le Retour" and "Térale" are taken from Le Retour (Jololi). The latter features Souriba Kouyaté on kora and "Saraba" on flute, while Youssou N'dour shares vocals on "Le Retour."